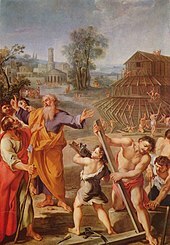 The construction of the Ark. Painted by an unknown French painter, around 1675. Noah's Ark, according to the book of Genesis (chapters 6–9) in the Bible, was a ship that God instructed Noah to build to save himself, his family (except his son Canaan and his wife Naamah because they refuse to came aboard the ark), and every kind of animal, because God was going to destroy the Earth by bringing about a great flood. It also says that the ark rested on the highest point in the area which was Mount Ararat, in what is now Turkey. There have been many recorded sightings of the ark over the years, however no physical evidence has been proven to show that the ark is currently on Mount Ararat. According to the Bible, the ark was made of gopherwood. Gopherwood is possibly the wood of a cypress tree, which was used for making ships in the Middle East. Cypress was good for making ships because it had strong wood from a large trunk and limbs. However, no one knows for sure what kind of tree gopherwood was. The ark was 300 cubits long, and 50 cubits wide; the height was 30 cubits. For a long time people did not know exactly how much a cubit was. One day in the later years of the 19th century, archaeologists found a tunnel in Jerusalem. This tunnel had been built in the days of King Hezekiah (around 700 B.C.). At the entrance was an inscription that said the tunnel was 1200 cubits long. The archaeologist measured the tunnel and saw it was 1800 feet long (54,000 centimeters). So now, people know that the Hebrew cubit, at least in the time of King Hezekiah, was 18 inches (45.72 centimeters). The shape and size of the ark were very good for floating (the ark was made to float, not for quickly going through the water). Many cargo ships are built like Noah's ark, because this design is very steady in the water. After Noah had finished putting the ark together with the gopherwood boards, he had to make it watertight (so that water would not go inside the ark). According to the Bible, God told Noah to use pitch, a waterproof material to paint it inside and outside. The building of the ark took Noah about 120 years, according to the time God gave to human beings before the flood started. During the Renaissance, a new kind of scholarship arose. These people never questioned the literal truth of the Ark story. They began to think about it from a practical point of view. In the 15th century, Alfonso Tostada wrote about the logic of the Ark, including things such as arrangements for getting rid of dung and circulating fresh air. The 16th-century geometrician Johannes Buteo worked out the ship's internal dimensions. He also allowed room for Noah's grinding mills and smokeless ovens. Later people also used his model. By the 17th century, the Americas had been discovered and were being explored. This led to new problems. All the species had to be spread again from one point, after the flood. The obvious answer was that man had spread over the continents after the destruction of the Tower of Babel. The different groups took animals with them. Some of the results seemed peculiar, though: why had the natives of North America taken rattlesnakes, but not horses, wondered Sir Thomas Browne in 1646? "How America abounded with Beasts of prey and noxious Animals, yet contained not in that necessary Creature, a Horse, is very strange." Browne was among the first people to question the notion of spontaneous generation. He was a medical doctor and amateur scientist making this observation in passing. Biblical scholars of the time such as Justus Lipsius (1547–1606) and Athanasius Kircher (c.1601–80) were also beginning to look at the Ark story more closely. They tried to fit the Biblical account with natural historical knowledge of their time. The resulting hypotheses were important. They were a driving force behind the study of the geographical distribution of plants and animals. This kind of study became biogeography in the 18th century. Natural historians began to draw connections between climates and the animals and plants adapted to them. One important theory said that the biblical Ararat was striped with different climatic zones. When climate changed, the associated animals moved as well. Eventually they spread to repopulate the globe. There was also the problem of an ever-expanding number of known species: for Kircher and earlier natural historians, there was little problem finding room for all known animal species in the Ark, but by the time John Ray (1627–1705) was working, just several decades after Kircher, many more had been found. Incorporating the full range of animal diversity into the Ark story was becoming increasingly difficult, and by 1700 few natural historians could see any reasons to believe in a literal interpretation of the Noah's Ark narrative. In 2011, a full-size replica of Noah's ark was built in Dordrecht in the Netherlands. ↑ Riss, Richard M. "Historical Evidence for Noah's Ark". Retrieved 7 November 2011. ↑ 3.0 3.1 Cohn, Norman (1996). Noah's Flood: The Genesis Story in Western Thought. New Haven & London: Yale University Press. ISBN 0-300-06823-9. This page was last changed on 2 November 2018, at 13:20.